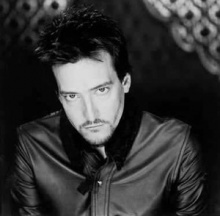 Richard Patrick (born May 10, 1968) is a former guitarist for Nine Inch Nails. He has played the guitar since the age of nine and names The Cure, U2, and Stone Temple Pilots as primary musical influences, specifically the inventive use of technology and flood sounds used by those artists. His actor brother, Robert Patrick, was often seen wearing NIN shirts and pins while Richard was a member, as evidenced by his headshots from the time. This can also be seen on the behind-the-scenes footage for Terminator 2: Judgment Day. According to the biography on the official Filter website, Patrick was nicknamed "Piggy" during his time with Nine Inch Nails. According to Brian Liesegang, Reznor was very upset when Patrick left the band and wrote the song "Piggy" about it shortly thereafter . Patrick spent two and a half years as the touring guitarist in NIN and can be seen in the music videos for "Down In It," "Head Like A Hole," "Wish," and "Gave Up." His only recorded contribution—a droning guitar sound—can be heard at the end of "Sanctified" on Pretty Hate Machine. He chose to leave the band during the recording of The Downward Spiral in 1993 due in part to Trent Reznor not allowing him any creative input or musical contributions, as well as often taking a lot of onstage physical abuse from Reznor. Patrick went on to form his own industrial rock band, Filter, with fellow NIN collaborator Brian Liesegang (though Liesegang left in 1997) and the band has released seven studio albums: Short Bus (1995), Title of Record (1999), The Amalgamut (2002), Anthems For The Damned (2008), The Trouble with Angels (2010), The Sun Comes Out Tonight (2013) and Crazy Eyes (2016). In 2005 Patrick also formed the band Army of Anyone with the DeLeo brothers of Stone Temple Pilots and in late 2006 the band released their eponymous album. The band split a year later and Patrick returned to Filter. As of 2018, Brian Liesegang has rejoined Filter. This page was last modified on 21 October 2018, at 01:29. This page has been accessed 70,969 times.